Die Martis, 6 Aprilis 1830. Robley et al. v. Brooke. Allardice & Boswell v. Robertson. Ld. Provost, &c. of Edinburgh et al. v. Mac Donald. Bp. Raphoe takes the Oaths. Mackenzie v. Houston, Appelliant's Petition for Time for his Case, referred to Appeal Com ee. Assizes for West Riding of Yorkshire, Petitions from Scammonden & Mirfield for holding, at Wakefield. East India, &c. Trade, Petitions from Dundee & Arbroath for opening, referred to East India Com ee. Coal Trade on the River Tyne, Petition of Shipowners of Newcastle respecting, referred to Com ee on the Coal Trade. St. Giles & St. George Bloomsbury Vestry Bill, Petition against. St. Giles & St. George Bloomsbury Vestry Bill. Emeris's et al. Petition to change Reference to the Judges. Sir G. Chetwynd's et al. Petition to change Reference to the Judges. Wallis's Divorce Bill, 2d Reading put off. Berkeley Peerage, Petition of Sir J. S. Sidney to be heard against. 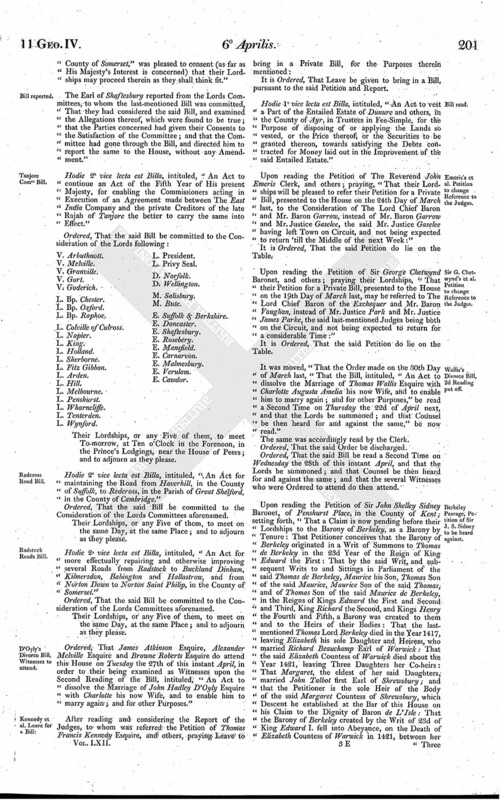 Parochial Registers, Scotland, Bill presented. Coals shipped from Newport & Cardiff to Bristol & Bridgewater, Papers respecting, Ordered. East Retford Election Bill, Petition against. The Answer of Charles Brooke to the Petition and Appeal of Caroline Robley, William Blake and James Cunningham, was this Day brought in. Ordered and Adjudged, by the Lords Spiritual and Temporal in Parliament assembled, That the said Petition and Appeal be, and is hereby dismissed this House, and that the Interlocutors therein complained of, be, and the same are hereby Affirmed. This Day William Lord Bishop of Raphoe took the Oaths, and also took and subscribed the Oath of Abjuration, pursuant to the Statutes. Ordered, That the Cause wherein Robert Whitehead is Appellant, and John Rowat is Respondent, be heard by Counsel at the Bar To-morrow. Ordered, That the Cause wherein George Brown is Appellant, and Alexander Ewing, and others, are Respondents, be heard by Counsel at the Bar To-morrow. Upon reading the Petition of Murdo Mackenzie Esquire, Appellant in a Cause depending in this House, to which Thomas Houston Esquire is Respondent; praying, "That their Lordships will be pleased to enlarge "the Period for lodging his Cases to the 29th Day of April instant:"
And also, Upon reading the Petition of the Clergy, Gentry, Freeholders and others, Inhabitants of the Parish of Mirfield, in the West Riding of the County of York, whose Names are thereunto subscribed; severally praying their Lordships, "That the Assizes and General Gaol Delivery for the Business of the West Riding of the County of York may in future be held at Wakefield, and that such other Relief in the Premises may be granted to the Petitioners as to their Lordships may seem meet:"
Upon reading the Petition of the Merchants, Shipowners and Manufacturers, and others interested in the Trade of the Town of Dundee, whose Names are thereunto subscribed; praying their Lordships, "That the Trade to the East Indies and China be thrown open; and that The East India Company's Charter be not renewed:"
Upon reading the Petition of the Members of the Incorporated Trades and Burgesses of Arbroath, North Britain, whose Names are thereunto subscribed; praying their Lordships, "That when the Charter of The East India Company expires, their Lordships will be pleased to limit their Powers in such Way and Manner as shall be consistent with the Interest of the Nation at large:"
Ordered, That the said Petition be referred to the last- mentioned Committee. Upon reading the Petition of the Shipowners of the Port of Newcastle, residing in the Town of North Shields, whose Property, to a great Extent, is embarked in the Shipping engaged in the Supply of the City of London and the Southern Ports of England with Coals, whose Names are thereunto subscribed; praying their Lordships to direct the Attention of the Committee on the Coal Trade to the Nature and Extent of the Local and Municipal Charges levied by the Corporation of Newcastle, as well as their Right to exact such Sums as they do, which in many Instances appear to be arbitrary and undefined as to Amount, and subject to excessive and uncalled-for Augmentation at the Will of the Officers of the said Corporation, more especially as relates to the exclusive Privilege which they assume of conveying the Ballast of the Petitioners Vessels within the Limits of the Port, which of late Years has been made subject to a most extraordinary Encrease, and now forms a considerable Item of Addition to the Charge for the Conveyance of Fuel to the City of London:"
With a Bill, intituled, "An Act for incorporating the Dundee Gas Light Company, and for the better lighting the Town of Dundee by Gas;" to which they desire the Concurrence of this House. With a Bill, intituled, "An Act for inclosing Lands in the Parish of Wistow, in the County of Huntingdon, and for extinguishing the Tithes in the said Parish;" to which they desire the Concurrence of this House. 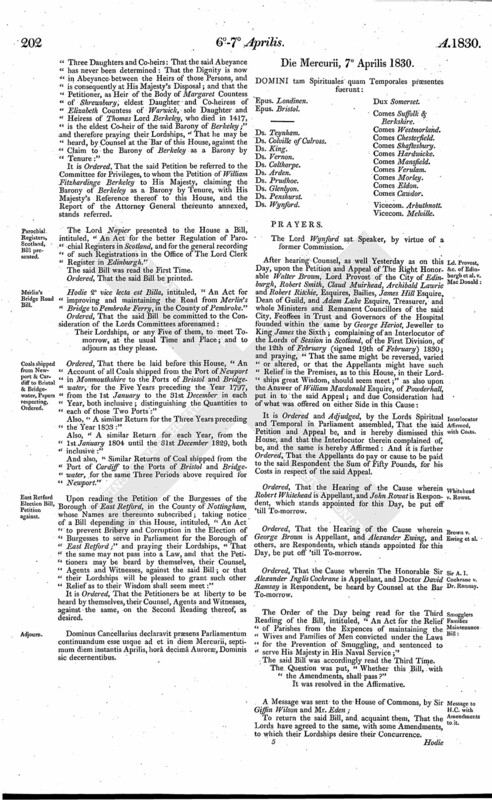 With a Bill, intituled, "An Act for more effectually repairing and improving the Road from Brighton to Shoreham, for building a Bridge over the River Adur at New Shoreham, and for making a Road to Lancing, and a Branch Road therefrom, all in the County of Sussex;" to which they desire the Concurrence of this House. To return the Bill, intituled, "An Act for inclosing Lands and extinguishing Tythes in the Parish of Haddenham, in the County of Buckingham;" and to acquaint this House, That they have agreed to their Lordships Amendments made thereto. Upon reading the Petition of Charles Cannon of No. 31, High Street, in the Parish of Saint George Bloomsbury, in the County of Middlesex, Leather Seller; taking notice of a Bill depending in this House, intituled, "An Act for the better Regulation of the Affairs of the joint Parishes of Saint Giles in the Fields and Saint George Bloomsbury, in the County of Middlesex, and of the separate Parishes of Saint Giles in the Fields and Saint George Bloomsbury, in the same County;" and praying their Lordships, "That the 26th and 155th Standing Orders of their Lordships House may not be deemed necessary to be suspended to facilitate the passing of the said Bill; and that the Petitioner and others may be allowed, if they shall be so advised, to appear at the Bar of this House, either by Counsel or their Agents, in support of their Objection; and that the Bill may be amended as therein mentioned:"
It was moved, "That the House do now resolve itself into a Committee upon the Bill, intituled, "An Act for the Relief of Parishes from the Expences of maintaining the Wives and Families of Men convicted under the Laws for the Prevention of Smuggling, and sentenced to serve His Majesty in His Naval Service." Pr. 1. L. 30. Leave out from ("Smuggling") to ("shall") in Press 2, Line 1. Pr. 2. L. 19. Leave out from ("Family") to ("and") in Line 22. Pr. 3. L. 13. Leave out from ("Parish") to ("and") in Line 15. Hodie 3 a vice lecta est Billa, intituled, "An Act for the better Paving and Sewerage of the Town of Liverpool, in the County Palatine of Lancaster; and for settling the Boundaries between the said Town and the Township of Kirkdale and Parts of the Townships of Everton and West Derby." Hodie 3 a vice lecta est Billa, intituled, "An Act for extending and amending the several Acts relating to the Docks and Harbour of Liverpool." The Earl of Shaftesbury reported from the Lords Committees, to whom the Bill, intituled, "An Act for more effectually repairing and improving the Road from Bolton-le-Moors to Blackburn, in the County Palatine of Lancaster, with Two Branches of Road therefrom; and for making and maintaining a Branch of Road to or near the Village of Lower Darwen," was committed; That they had considered the said Bill, and examined the Allegations thereof, which were found to be true; and that the Committee had gone through the Bill, and directed him to report the same to the House, without any Amendment." The Earl of Shaftesbury made the like Report from the Lords Committees, to whom the Bill, intituled, "An Act for more effectually repairing and improving the Road from or near Edenfield Chapel to Little Bolton, and the Road leading from and out of the said Road at Booth Pits to or near Bury Bridge, in the County Palatine of Lancaster; and for making and maintaining Three several Branches of Road communicating therewith," was committed. 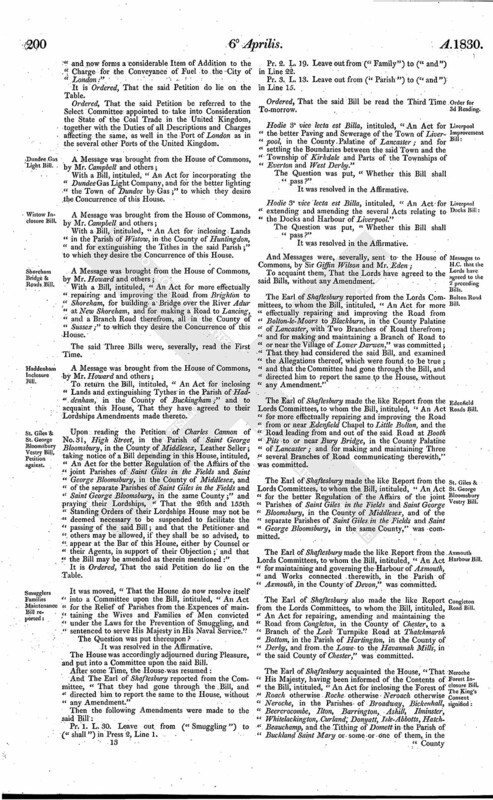 The Earl of Shaftesbury made the like Report from the Lords Committees, to whom the Bill, intituled, "An Act for the better Regulation of the Affairs of the joint Parishes of Saint Giles in the Fields and Saint George Bloomsbury, in the County of Middlesex, and of the separate Parishes of Saint Giles in the Fields and Saint George Bloomsbury, in the same County," was committed. The Earl of Shaftesbury made the like Report from the Lords Committees, to whom the Bill, intituled, "An Act for maintaining and governing the Harbour of Axmouth, and Works connected therewith, in the Parish of Axmouth, in the County of Devon," was committed. The Earl of Shaftesbury also made the like Report from the Lords Committees, to whom the Bill, intituled, "An Act for repairing, amending and maintaining the Road from Congleton, in the County of Chester, to a Branch of the Leek Turnpike Road at Thatchmarsh Bottom, in the Parish of Hartington, in the County of Derby, and from the Lowe to the Havannah Mills, in the said County of Chester," was committed. The Earl of Shaftesbury acquainted the House, "That His Majesty, having been informed of the Contents of the Bill, intituled, "An Act for inclosing the Forest of Roach otherwise Roche otherwise Neroach otherwise Neroche, in the Parishes of Broadway, Bickenhall, Beercrocombe, Ilton, Barrington, Ashill, Ilminster, Whitelackington, Curland, Donyatt, Isle-Abbotts, HatchBeauchamp, and the Tithing of Domett in the Parish of Buckland Saint Mary or some or one of them, in the County of Somerset," was pleased to consent (as far as His Majesty's Interest is concerned) that their Lordships may proceed therein as they shall think fit." The Earl of Shaftesbury reported from the Lords Committees, to whom the last-mentioned Bill was committed, "That they had considered the said Bill, and examined the Allegations thereof, which were found to be true; that the Parties concerned had given their Consents to the Satisfaction of the Committee; and that the Committee had gone through the Bill, and directed him to report the same to the House, without any Amendment." Hodie 2a vice lecta est Billa, intituled, "An Act to continue an Act of the Fifth Year of His present Majesty, for enabling the Commissioners acting in Execution of an Agreement made between The East India Company and the private Creditors of the late Rajah of Tanjore the better to carry the same into Effect." Hodie 2a vice lecta est Billa, intituled, "An Act for maintaining the Road from Haverhill, in the County of Suffolk, to Redcross, in the Parish of Great Shelford, in the County of Cambridge." Ordered, That the said Bill be committed to the Consideration of the Lords Committees aforenamed. Hodie 2a vice lecta est Billa, intituled, "An Act for more effectually repairing and otherwise improving several Roads from Radstock to Buckland Dinham, Kilmersdon, Babington and Hallastrow, and from Norton Down to Norton Saint Philip, in the County of Somerset." Ordered, That James Atkinson Esquire, Alexander Melville Esquire and Browne Roberts Esquire do attend this House on Tuesday the 27th of this instant April, in order to their being examined as Witnesses upon the Second Reading of the Bill, intituled, "An Act to dissolved the Marriage of John Hadley D'Oyly Esquire with Charlotte his now Wife, and to enable him to marry again; and for other Purposes." Hodie 1a vice lecta est Billa, intituled, "An Act to vest a Part of the Entailed Estate of Dunure and others, in the County of Ayr, in Trustees in Fee-Simple, for the Purpose of disposing of or applying the Lands so vested, or the Price thereof, or the Securities to be granted thereon, towards satisfying the Debts contracted for Money laid out in the Improvement of the said Entailed Estate." Upon reading the Petition of The Reverend John Emeris Clerk, and others; praying, "That their Lordships will be pleased to refer their Petition for a Private Bill, presented to the House on the 24th Day of March last, to the Consideration of The Lord Chief Baron and Mr. Baron Garrow, instead of Mr. Baron Garrow and Mr. Justice Gaselee, the said Mr. Justice Gaselee having left Town on Circuit, and not being expected to return 'till the Middle of the next Week:"
Upon reading the Petition of Sir George Chetwynd Baronet, and others; praying their Lordships, "That their Petition for a Private Bill, presented to the House on the 19th Day of March last, may be referred to The Lord Chief Baron of the Exchequer and Mr. Baron Vaughan, instead of Mr. Justice Park and Mr. Justice James Parke, the said last-mentioned Judges being both on the Circuit, and not being expected to return for a considerable Time:"
It was moved, "That the Order made on the 30th Day of March last, That the Bill, intituled, An Act to dissolve the Marriage of Thomas Wallis Esquire with Charlotte Augusta Amelia his now Wife, and to enable him to marry again; and for other Purposes," be read a Second Time on Thursday the 22d of April next, and that the Lords be summoned; and that Counsel be then heard for and against the same," be now "read." Ordered, That the said Bill be read a Second Time on Wednesday the 28th of this instant April, and that the Lords be summoned; and that Counsel be then heard for and against the same; and that the several Witnesses who were Ordered to attend do then attend. Upon reading the Petition of Sir John Shelley Sidney Baronet, of Penshurst Place, in the County of Kent; setting forth, "That a Claim is now pending before their Lordships to the Barony of Berkeley, as a Barony by Tenure: That Petitioner conceives that the Barony of Berkeley originated in a Writ of Summons to Thomas de Berkeley in the 23d Year of the Reign of King Edward the First: That by the said Writ, and subsequent Writs to and Sittings in Parliament of the said Thomas de Berkeley, Maurice his Son, Thomas Son of the said Maurice, Maurice Son of the said Thomas, and of Thomas Son of the said Maurice de Berkeley, in the Reigns of Kings Edward the First and Second and Third, King Richard the Second, and Kings Henry the Fourth and Fifth, a Barony was created to them and to the Heirs of their Bodies: That the last mentioned Thomas Lord Berkeley died in the Year 1417, leaving Elizabeth his sole Daughter and Heiress, who married Richard Beauchamp Earl of Warwick: That the said Elizabeth Countess of Warwick died about the Year 1421, leaving Three Daughters her Co-heirs: That Margaret, the eldest of her said Daughters, married John Talbot first Earl of Shrewsbury; and that the Petitioner is the sole Heir of the Body of the said Margaret Countess of Shrewsbury, which Descent he established at the Bar of this House on his Claim to the Dignity of Baron de L'Isle: That the Barony of Berkeley created by the Writ of 23d of King Edward I. fell into Abeyance, on the Death of Elizabeth Countess of Warwick in 1421, between her Three Daughters and Co-heirs: That the said Abeyance has never been determined: That the Dignity is now in Abeyance between the Heirs of those Persons, and is consequently at His Majesty's Disposal; and that the Petitioner, as Heir of the Body of Margaret Countess of Shrewsbury, eldest Daughter and Co-heiress of Elizabeth Countess of Warwick, sole Daughter and Heiress of Thomas Lord Berkeley, who died in 1417, is the eldest Co-heir of the said Barony of Berkeley;" and therefore praying their Lordships, "That he may be heard, by Counsel at the Bar of this House, against the Claim to the Barony of Berkeley as a Barony by Tenure:"
It is Ordered, That the said Petition be referred to the Committee for Privileges, to whom the Petition of William Fitzhardinge Berkeley to His Majesty, claiming the Barony of Berkeley as a Barony by Tenure, with His Majesty's Reference thereof to this House, and the Report of the Attorney General thereunto annexed, stands referred. The Lord Napier presented to the House a Bill, intituled, "An Act for the better Regulation of Parochial Registers in Scotland, and for the general recording of such Registrations in the Office of The Lord Clerk Register in Edinburgh." Hodie 2a vice lecta est Billa, intituled, "An Act for improving and maintaining the Road from Merlin's Bridge to Pembroke Ferry, in the County of Pembroke." Ordered, That there be laid before this House, "An Account of all Coals shipped from the Port of Newport in Monmouthshire to the Ports of Bristol and Bridgewater, for the Five Years preceding the Year 1797, from the 1st January to the 31st December in each Year, both inclusive; distinguishing the Quantities to each of those Two Ports:"
Also, "A similar Return for the Three Years preceding the Year 1803:"
Also, "A similar Return for each Year, from the 1st January 1804 until the 31st December 1829, both inclusive:"
And also, "Similar Returns of Coal shipped from the Port of Cardiff to the Ports of Bristol and Bridgewater, for the same Three Periods above required for Newport." 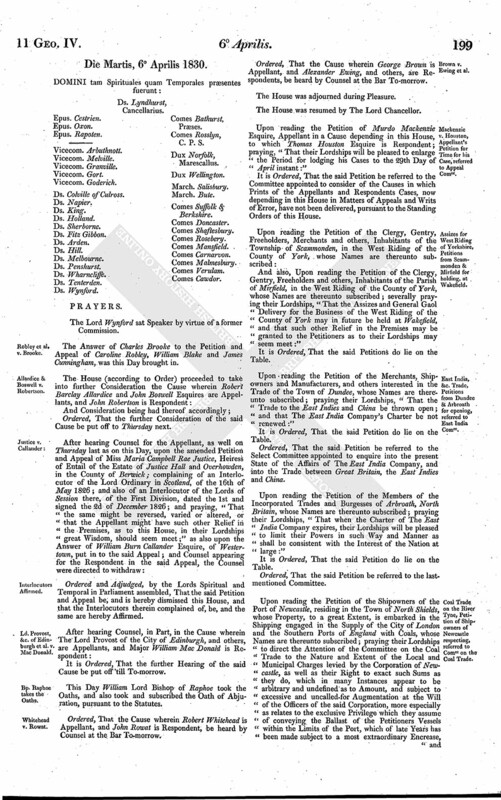 Upon reading the Petition of the Burgesses of the Borough of East Retford, in the County of Nottingham, whose Names are thereunto subscribed; taking notice of a Bill depending in this House, intituled, "An Act to prevent Bribery and Corruption in the Election of Burgesses to serve in Parliament for the Borough of East Retford;" and praying their Lordships, "That the same may not pass into a Law, and that the Petitioners may be heard by themeselves, their Counsel, Agents and Witnesses, against the said Bill; or that their Lordships will be pleased to grant such other Relief as to their Wisdom shall seem meet:"
It is Ordered, That the Petitioners be at liberty to be heard by themselves, their Counsel, Agents and Witnesses, against the same, on the Second Reading thereof, as desired. Dominus Cancellarius declaravit præsens Parliamentum continuandum esse usque ad et in diem Mercurii, septimum diem instantis Aprilis, horâ decimâ Auroræ, Dominis sic decernentibus.